ForexMart is a trademark of Tradomart Ltd. (earlier Fxco Trading Ltd.). This brokerage firm is registered in Cyprus and is regulated by the Cyprus Securities and Exchange Commission (CySEC). The broker provides services to trade Forex, CFDs on shares and spot metals through the most popular trading platform, MetaTrader 4. Tradomart Ltd. delivers its brokerage services under the trademark of ForexMart, which is properly licensed and operates under the authority of the Cyprus Securities and Exchange Commission (license number 266/15). Besides, Tradomart Ltd. holds a cross-border license issued by the CySEC, permitting investments and additional services in compliance with the European Financial Instruments Directive (MiFID) across the European Economic Area. The CySEC applies particular rules for brokerage companies. One of such essential rules is the requirement to the minimum capital size which should be at least €1 million. For extra safety of clients’ funds, the company is a certified member of the Investor Compensation Fund (ICF). It means that in case of the broker’s bankruptcy a client will be able to withdraw up to €20,000. The minimum deposit with the broker starts from USD/EUR/GBP 1. Compared to other brokers in Cyprus which require from $50 up to $500, ForexMart offers very beneficial trading conditions in the forex industry. 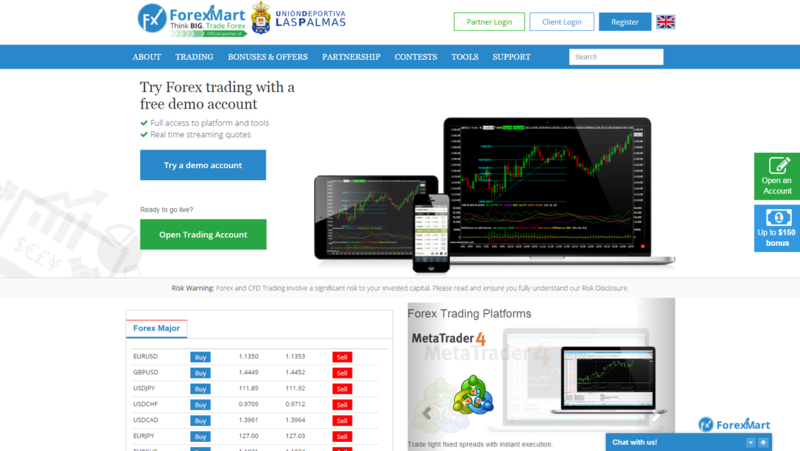 With ForexMart, traders can choose between two account types: ForexMart Standard and ForexMart Zero Spread. Besides, a demo account is also available with the broker. The first account type offers fixed spreads and a zero commission. So, a spread equals 2 pips for EUR/USD. The second type of a trading account means a zero spread for the same pair but the broker charges a commission of 2 pips. Other companies under the CySEC regulation set forth similar fixed spreads. The maximum leverage with the broker is one of the biggest among other retail brokers. So clients can set leverage of 1:1,000. Importantly, high leverage enlarges both profits and losses. Therefore, some brokers restrict their leverage. ForexMart offers leverage of 1:100 to trade gold and silver. Leverage for CFDs is 1:20. For trading accounts deposited with over $1,000, leverage can be raised to 1:500. Clients trade through the MT4 trading platform which allows them to monitor up to four charts in parallel. The trading platform is equipped with several technical indicators and expert advisors (EA). The broker offers its clients a welcome 30% deposit bonus and a non-deposit bonus up to $150. They cannot be used together with other bonuses. Those clients who have received a non-deposit bonus are provided with leverage of 1:200. The broker allows its clients to deposit an account and withdraw money by means of bank cards, wire transfer, and electronic payment systems such as Neteller, Skrill, PayPal, and Paxum. I 've found a better result with ForexМart broker in a fixed spreads account. Overall my trading experience is satisfied with they're a lot of service and features. their server is stable, so the platform has the fastest execution, Also it is included with much technical analysis and indicators tools too. Even I have used Expert Advisors (EAs) in my trading. Till now my EAs works and getting $372 profit so far. I've withdrawal almost my profit via Neteller. I know ForexМart have CySEC regulation and they are safe. I have experienced that ForexМart broker's service is outstanding on the MT4 platform. Which always have fixed spread with up to date market quote. So they have the fastest ECN execution in the market. I have used a mobile app too. So I can trade from anywhere by using this platform. They have transparent transactions via Skrill. So I can withdraw my profit within 2 hours. Actually, ForexМart is a perfect and professional broker. As a professional trader, I say Forexmart's MT4 platform is stable than others brokers. Because always I get the real price quote and best execution, Also their platform is ultra modern with current news, profitable technical analysis, helpful trading tools and analytical indicators. So I can open an order instantly ay my desired position so far. Also, I am satisfied with their payment system, As I can withdraw my profit via Skrill payment system within a day. Overall ForexМart's broker fixed spread and service are fair to me. As a new broker in the market, ForexМart has so much stable and reliable platform for trading to me. I prefer them due to the tight spread and best execution all of my positions, most of them were perfect. In the platform, I have found best graphing charts and I have used their one-click trading tools, which is amazing tools for open or close a trade instantly. So I say ForexМart's service is professional, they helps traders by given analysis and all their pricing always fixed on the platform. I can withdraw my profit safely via Skrill payment service so far. Actually, the ForexМart broker has outstanding platform, which needed for any traders to make a profit in the forex market without any trouble. I am trading in a micro account with Forex mart since 2017. And Till now I have experienced a strong platform in the market, where I found the real market quote and I can use many trading and analytical tools. They have 100% fair trading conditions and transparent payment system. So they gained my trust, while I haven't any issues with them. I am pleased with Forex mart company. I am quite pleased with ForexМart. I made a deposit of $630 dollar and I did get my 30% welcome bonus in instantly. I was very pleased to see that. I also like their trading conditions very low spreads on standard account, my EA's are making good profit. I earned $280 just in my first month of trading. Until now I withdraw only once via Skrill and the amount was $200, and they processed it within 4 hours as they promised. I hope I will go far with this broker. Forexmart is one of the very best and most transparent Forex brokers in the world, and their immense success proves this. If any trader is complaining, then they should check their trading methods. I have lost a lot of money because I traded greedily, but after a lot of training I have been able to make some profits for myself on my ForexMart Standard account. I have made withdrawal twice through skrill, although I was asked to submit my documents before withdrawal can made which I did, and I later got my money. I highly recommend this broker. It looks like trading at ForexMart will give me big advantage. I want to start trading and feel interested in the information and system offered by this broker. I think with a minimum of $ 1 accounts and leverage: from 1: 1 up to 1: 1,000 will generate a big profit. In addition, from several trading forums, many traders expressed satisfaction and the many advantages they get from this broker. The execution is fair 1-3 seconds for every transactions, deposit and withdraw process run so fast and the platform easy to use even in the mobile applications and many more. However they do not provide free swap account. I do not want to trade with swap, not in accordance with my belief. Are there any other options from this broker that I can use? Is there a trader who has ever used a similar program in ForexMart? Please give me a suggestion because I am interested in this broker.